Stroke is a neurological deficit attributed to an acute focal injury of the central nervous system (CNS) caused by an injury to a blood vessel. The injury is either a blood clot in a blood vessel or a rupture of a blood vessel. The area of the brain deprived by blood flow usually has a central area of most severe damage (that often dies) that is surrounded by injured tissue with decreased blood flow and neurologic dysfunction. HBOT works on this surrounding brain tissue to salvage the tissue and restore function. Loss of a specific neurological function that is served by the brain tissue that is stroked. The most common stroke syndromes involve facial drooping, weakness or paralysis of an arm, leg, or one side of the body, slurred speech, confusion, disorientation, numbness or tingling in the face, arm, or leg, or altered level of consciousness. There are a wide range of benefits, but under Dr. Harch’s care, patients generally see partial or complete reversal of the neurological deficit. The most important factor in HBOT treatment of stroke has been the proper dosing of HBOT, based on the type of stroke, and time of intervention. While the best results are derived from early application of HBOT, most patients don’t get HBOT until years after their stroke. Even in these chronic cases, which comprise the bulk of stroke patients Dr. Harch has treated over the past 29 years, patients can still experience improvement in their motor, sensory, cognitive, gait, balance, and other symptoms. One of the most comprehensive reviews of HBOT in stroke is presented by Dr. Jain in the Textbook of Hyperbaric Medicine. The net result of all studies and the treatment of over 2000 stroke patients is a beneficial effect of HBOT on all phases of stroke. Mr. Bennett was a 68 year old man who had experienced multiple small strokes over his lifetime, with the last stroke occurring 2.5 years before his referral for HBOT. The last stroke was the most serious. After this stroke, Mr. Bennett had intractable dizziness, poor balance, right body incoordination, poor motor control, and was walking-cane dependent. He was now housebound, afraid that he would fall in public if he ventured out with his cane and knee brace. The constellation of these symptoms caused a severe depression where he voiced suicidal thoughts, saying that he was only staying alive for his grandchildren. Mr. Bennett underwent a SPECT scan, and the next day received a single HBOT dose followed by a repeat SPECT scan. Over the course of the next 5 months he received 80 HBOTs in two blocks, with a break in between each set of 40. During this time and after treatment, he experienced a marked decrease in his dizziness, improved balance, improved right body coordination, and better control of his left knee, such that he needed neither a cane nor knee brace. With these improvements, he resumed his previously active lifestyle, was no longer housebound, and had a marked improvement in his depression. 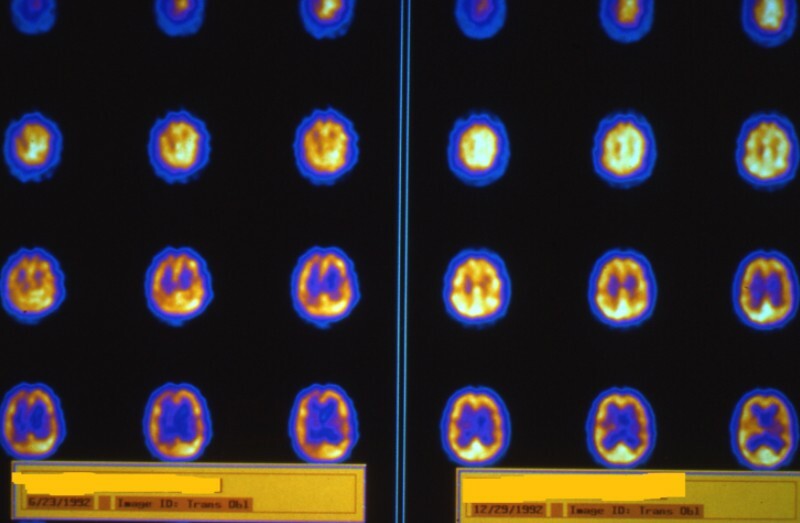 His SPECT brain imaging showed a remarkable improvement and was responsible for his clinical improvement. 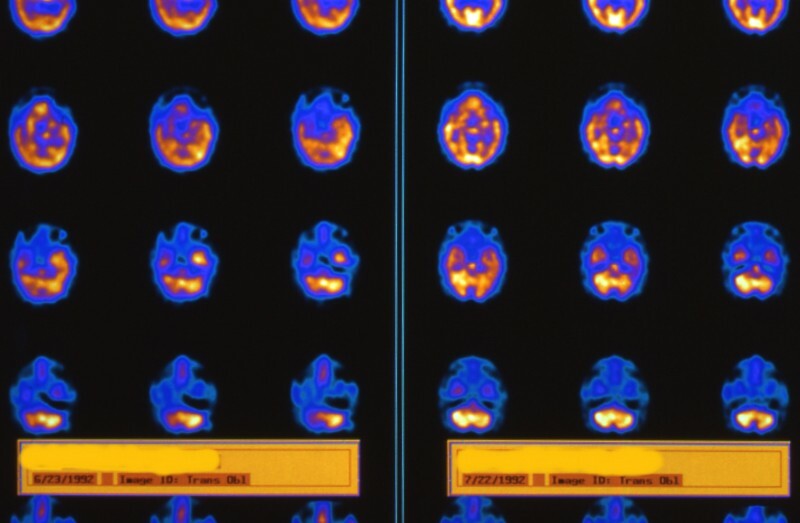 Mr. Bennet’s SPECT scans before and after a single HBOT: The pre-HBOT scan is on the left and the after-1 HBOT scan on the right. The first picture is the top half of the brain and the second picture is the lower half. Note the global increase in brain blood flow after just 1 HBOT. 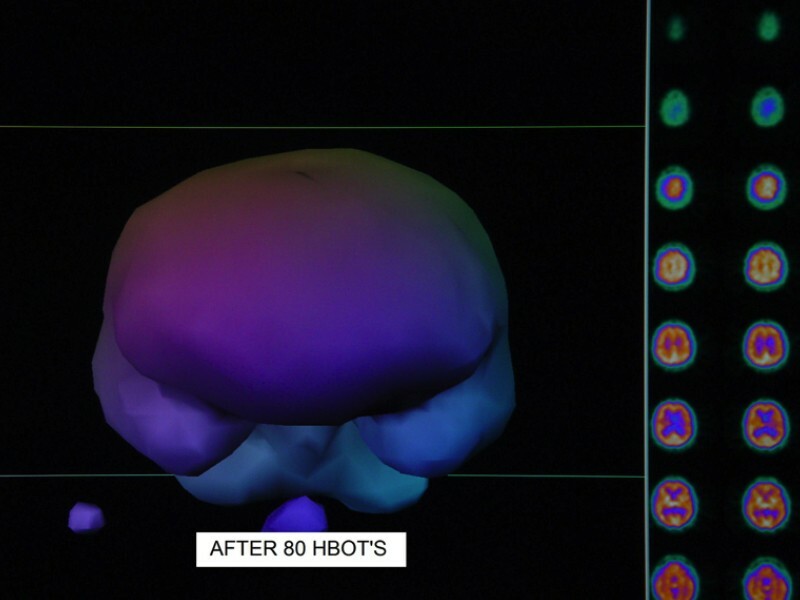 Mr. Bennet’s SPECT scans before HBOT and after 80 HBOTs: The before HBOT scan is on the left and the after 80 HBOTs’ SPECT on the right. Again, note the global improvement in brain blood flow which is now more permanent and responsible for the clinical improvements Mr. Bennett experienced. 3D surface reconstruction of Mr. Bennett’s scan before HBOT: while the slices capture global abnormalities, the surface reconstruction mainly shows reduced blood flow to the right temporal lobe (on the left side of the image), and the right cerebellum (in the back at the bottom of the image). 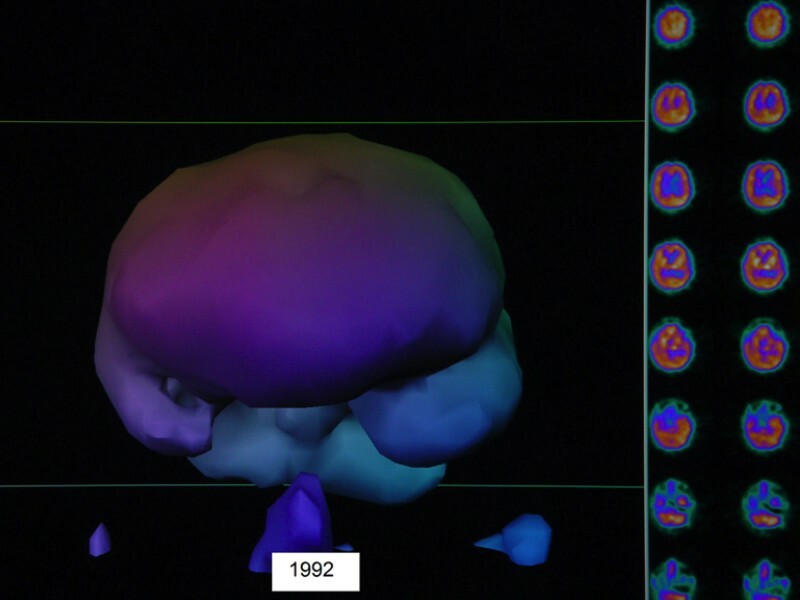 3D surface reconstruction of Mr. Bennett’s SPECT scan after one HBOT: note the smoother appearance of the surface of the brain and the marked improvement in the right temporal lobe and cerebellum. 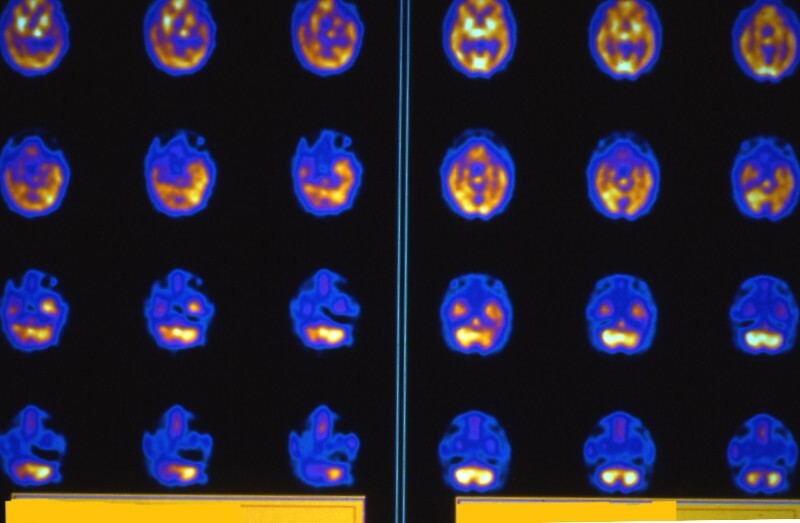 Note: A SPECT scan is often performed before HBOT and again after one HBOT to display recoverable brain tissue. In order for the increased blood flow to be more permanent, at least approximately 40 treatments are then completed. 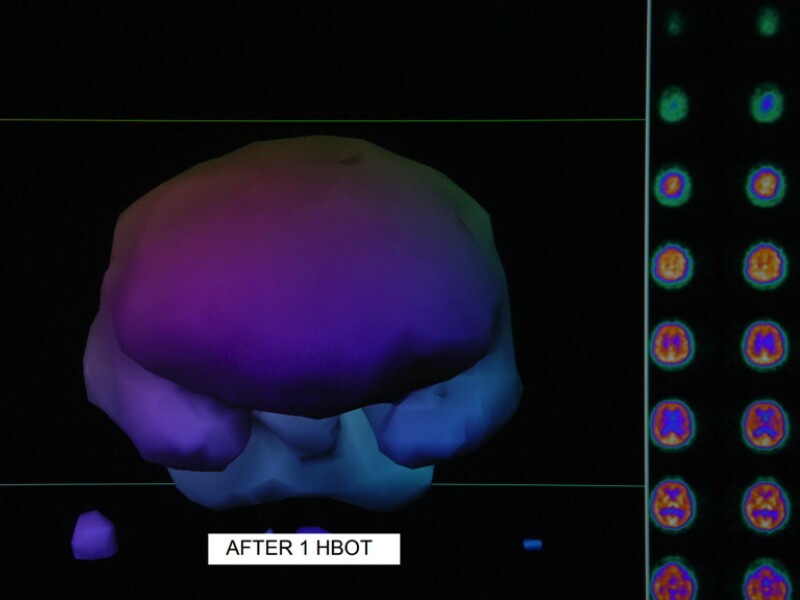 3D surface reconstruction of Mr. Bennett’s SPECT scan after 80 HBOTs: note the improvements seen on the pre-HBOT scan which are now more permanent and responsible for Mr. Bennett’s clinical improvement. 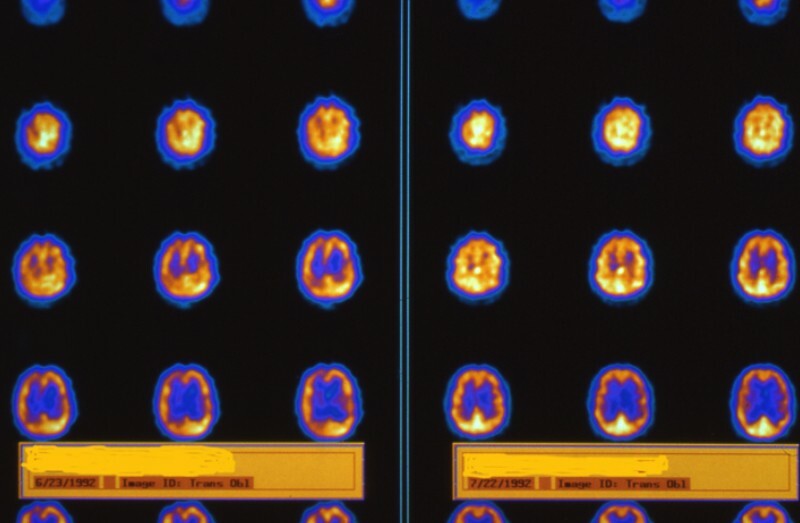 https://www-ncbi-nlm-nih-gov.ezproxy.lsuhsc.edu/pubmed/1968553 (One of the most dramatic cases of HBOT in chronic stroke that suggested the concept that injured (stroked) brain tissue could exist in an idling state for 14 years and was able to be re-activated. Published by Dr. Richard Neubauer, Dr. Harch’s mentor). https://www-ncbi-nlm-nih-gov.ezproxy.lsuhsc.edu/pubmed/7394869 (An early review of 122 stroke cases treated by Dr. Neubauer).